Genomic Health Expands Offering to Prostate Cancer Patients with Launch of Oncotype DX® AR-V7 Nucleus Detect™ Test to Predict Treatment Response in Metastatic Disease | Genomic Health, Inc.
REDWOOD CITY, Calif., Feb. 26, 2018 /PRNewswire/ -- Genomic Health, Inc. (NASDAQ: GHDX) today announced the U.S. commercial launch of the Oncotype DX® AR-V7 Nucleus Detect™ test. 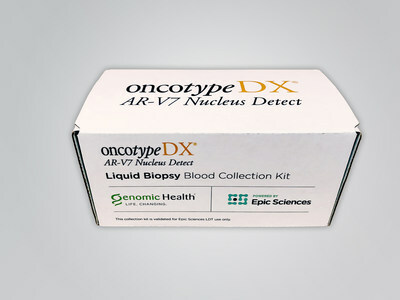 The first and only liquid biopsy test of its kind, the Oncotype DX AR-V7 Nucleus Detect test was developed by Epic Sciences to help prolong the lives of men with metastatic castration-resistant prostate cancer (mCRPC) by accurately detecting a splice variant of the androgen receptor protein (AR-V7) in the nucleus of circulating tumor cells (CTCs). Knowledge of a patient's AR-V7 status enables physicians to confidently decide whether men treated with an androgen receptor-signaling inhibitor (ARSI) therapy, such as enzalutamide and abiraterone, need to start another type of ARSI or switch to chemotherapy. "Virtually all men with metastatic prostate cancer eventually develop mCRPC, and a substantial portion of these patients' cancers acquire androgen receptor splice variants that cause drug resistance. This can lead to the use of costly, ineffective hormonal therapies that result in poor patient outcomes," said William R. Berry, M.D., clinical associate in the Department of Medicine at Duke University School of Medicine. "By enabling a tailored treatment approach with Oncotype DX AR-V7 Nucleus Detect, we may improve patient survival in a cost-efficient manner for the health system." Powered by Epic Sciences' proprietary No Cell Left Behind® platform, the Oncotype DX AR-V7 Nucleus Detect test has been validated to accurately identify men who are positive for AR-V7 from a single blood draw and a binary result. Two clinical validation studies, led by Memorial Sloan Kettering Cancer Center (MSK) across multiple sites, collectively included 360 patients and demonstrated that men who are AR-V7 positive and treated with chemotherapy survive longer than those on ARSI therapy. Results also demonstrated that approximately 20 percent of men who received initial ARSI treatment became AR-V7 positive and developed drug resistance as a result. Findings from the first validation study were published in JAMA Oncology in 2016. Results from the second validation study were presented at the 2018 Genitourinary Cancers Symposium of the American Society of Clinical Oncology and submitted for publication in a major peer-reviewed journal. "AR-V7 is an exciting breakthrough in fighting prostate cancer as it immensely helps in determining the best treatment pathways for patients," said Jamie Bearse, chief executive officer, ZERO - The End of Prostate Cancer. "Men and families face anxiety and tough decisions over treatments but this tool, for example, will enable those men to make determinations like when to move on from hormonal therapy to chemotherapy to improve patient outcomes." "The technology from our collaboration partner, Epic Sciences, powers the Oncotype DX AR-V7 Nucleus Detect test, providing an unbiased approach to minimize the risk of CTCs being missed, resulting in superior test performance, sensitivity and specificity," said Phil Febbo, M.D., chief medical officer, Genomic Health. "The launch of the Oncotype DX AR-V7 Nucleus Detect test marks an important step forward in our mission to use biology to guide care across the prostate cancer continuum by providing urologists with a suite of actionable genomic tests." Designed by Epic Sciences and based on results from multiple studies led by Memorial Sloan Kettering Cancer Center, the Oncotype DX® AR-V7 Nucleus Detect™ test is the first and only liquid biopsy test of its kind that can potentially prolong the lives of men with metastatic castration-resistant prostate cancer (mCRPC) by helping their physician identify the most effective treatment. Through a blood draw, the test detects AR-V7 protein in the nucleus of circulating tumor cells utilizing Epic Sciences' No Cell Left Behind® platform to accurately identify patients who are resistant to androgen receptor (AR)-targeted therapies and who should instead switch to chemotherapy. The Oncotype DX® AR-V7 Nucleus Detect™ test will be performed by Epic Sciences at its centralized, CLIA-certified laboratory in San Diego, Calif. To learn more about the Oncotype DX AR-V7 Nucleus Detest test, visit www.OncotypeIQ.com. Genomic Health, Inc. (NASDAQ: GHDX) is the world's leading provider of genomic-based diagnostic tests that help optimize cancer care, including addressing the overtreatment of the disease, one of the greatest issues in healthcare today. With its Oncotype IQ® Genomic Intelligence Platform, the company is applying its world-class scientific and commercial expertise and infrastructure to lead the translation of clinical and genomic big data into actionable results for treatment planning throughout the cancer patient journey, from diagnosis to treatment selection and monitoring. The Oncotype IQ portfolio of genomic tests and services currently consists of the company's flagship line of Oncotype DX ® gene expression tests that have been used to guide treatment decisions for more than 850,000 cancer patients worldwide. Genomic Health is expanding its test portfolio to include additional liquid- and tissue-based tests, including the recently launched Oncotype DX® AR-V7 Nucleus Detect™ test. The company is based in Redwood City, California, with international headquarters in Geneva, Switzerland. For more information, please visit, www.GenomicHealth.com and follow the company on Twitter: @GenomicHealth, Facebook, YouTube and LinkedIn. This press release contains forward-looking statements about Genomic Health, Inc. within the meaning of the Private Securities Litigation Reform Act of 1995. Forward-looking statements are subject to risks and uncertainties that could cause actual results to differ materially, and reported results should not be considered as an indication of future performance. These risks and uncertainties include, but are not limited to Genomic Health's business model; the regulation of Genomic Health's tests or any tests offered through its commercial channel including Oncotype DX AR-V7 Nucleus Detect; the applicability of clinical study results to actual outcomes; Genomic Health's ability to develop, commercialize or collaborate to offer any new tests in new markets domestically and internationally; the risk that sufficient levels of reimbursement may not be obtained or maintained, domestically or abroad, for Genomic Health's tests and tests offered through its commercial channel including Oncotype DX AR-V7 Nucleus Detect; competition; unanticipated costs or delays in research and development efforts; Genomic Health's ability or the ability of Epic Sciences to obtain capital when needed to support the activities contemplated by the collaboration; and the other risks and uncertainties set forth in Genomic Health's filings with the Securities and Exchange Commission, including the risks set forth in Genomic Health's Quarterly Report on Form 10-Q for the quarter ended September 30, 2017. These forward-looking statements speak only as of the date hereof. Genomic Health disclaims any obligation to update these forward-looking statements. NOTE: The Genomic Health logo, Oncotype, Oncotype DX, Recurrence Score, DCIS Score, Oncotype SEQ, Liquid Select, Genomic Prostate Score, Oncotype DX AR-V7 Nucleus Detect and Oncotype IQ are trademarks or registered trademarks of Genomic Health, Inc. No Cell Left Behind is a trademark or registered trademark of Epic Sciences, Inc. All other trademarks and service marks are the property of their respective owners.